If nostalgia were a musical instrument it would be an oboe. Conveying weighty, beautiful music tinged with sadness. Certain places and memories bring a smile pared with an ache somewhere near my solar plexus. I have oboe memories of The Gremlin Drive in roadhouse, when visiting my grandparents in Salisbury as a child. My mother remembers going there with school friends. Growing up in Durban many nights out ended with a milkshake at The Tropicale Roadhouse, our car barely containing the energy and potency of youth. Listening to Sam Cowen conduct an interview on radio 702 about road houses past and present, I felt compelled to sample our local offerings. I have lived (often begrudgingly) in Boksburg for 15 years. The fact that it is home to more than 6 road houses suddenly deemed it more charming. When I lived on the other side of town, supper was often procured at a nearby roadhouse, until one day a roach showed up in my box of chips. Ten Roadhouse free years passed since then. Having decided to sample current roadhouse fare, I asked which are best, on a local Facebook group. The response was immediate, lively and impassioned. People feel strongly about their favourites! Three top contenders emerged, The Fireplace (19 votes), Kota Joe (8 votes) and Orama (6 votes). Other names popped up but not to a significant degree. The home of roach was only favoured by one. A plan of action was formulated to visit the top 3. Clifford felt very iffy about this project. He had never eaten at a roadhouse until last night, and was pondering the merits of procuring a false moustache for the outing. 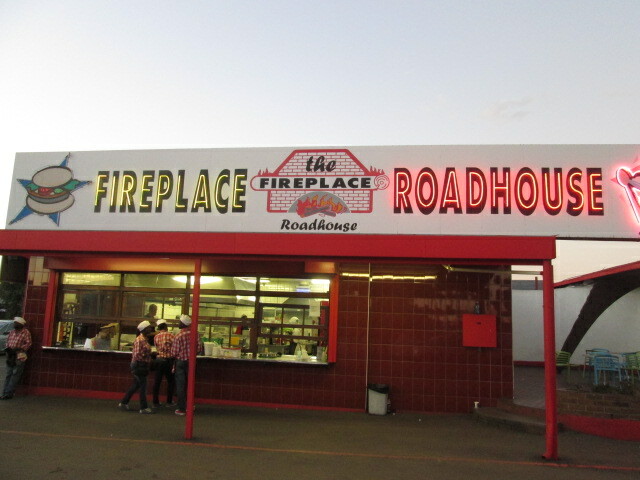 I chose The Fireplace as the first roadhouse to visit. Since opening in 1958 it has become steeped in local history, watching generations pass through. At first we could not find the Boksburg branch of The Fireplace, the address was not in the Garmin. I saved the GPS co-ordinates when we got there, they are S26° 12′ 31.1″ E 028° 16′ 30.9″ There are also branches of The Fireplace in Primrose and Benoni (old UFO) but as I was focusing on Boksburg we chose to visit the original one. Despite being in a dodgy area, I could imagine the haunting notes of an oboe weaving through threads of time. He will deny it but I’m certain that my husband enjoyed the unusual experience of eating a meal from a tray clipped onto the car window. He certainly was impressed with both the quality of his double chicken burger (R50), and the generosity of the portion. 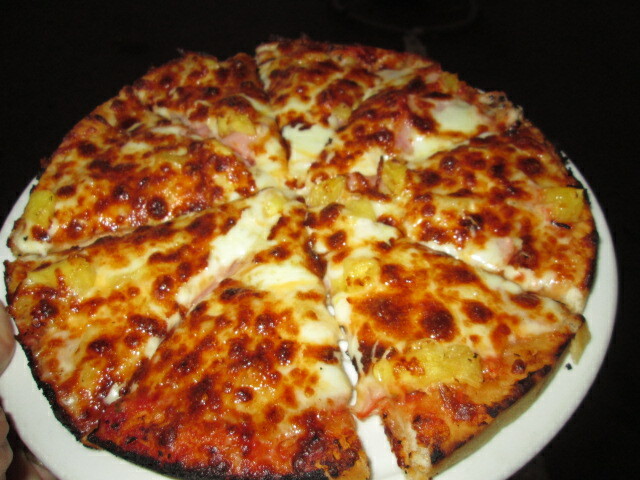 Our children loved their shared Hawaiian Pizza (R65). Fjord announced that it was the best pizza he’s had, other than our home-made ones. 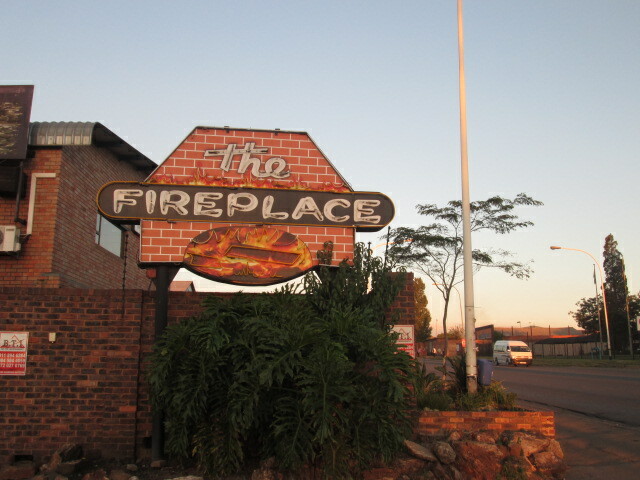 My Fireplace Burger (R34) was excellent. I was tempted to try traditional roadhouse fare such as a Dagwood, Blondie or Popeye but the simple burger appealed most. Roadhouses are famous for milkshakes and soda floats. 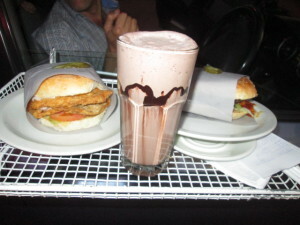 The children shared a chocolate milkshake and loved it. Cliff and I shared a raspberry float, which is apparently an iconic Fireplace offering. Before leaving The Fireplace the children were already asking to return. Due to budgetary constraints we will sample Kota Joe and Orama over the next 2 months. Watch this space for our next adventure. Two great minds think alike. We went to the one and only roadhouse left on this side of town on Sunday (The Burger Box) – Inspired by Masterchef 🙂 Also in a dodge area. We have been before but just for a milkshake – best ever milkshakes. Mark also having never eaten in a car did not think it was a good idea. Said it was impossible. 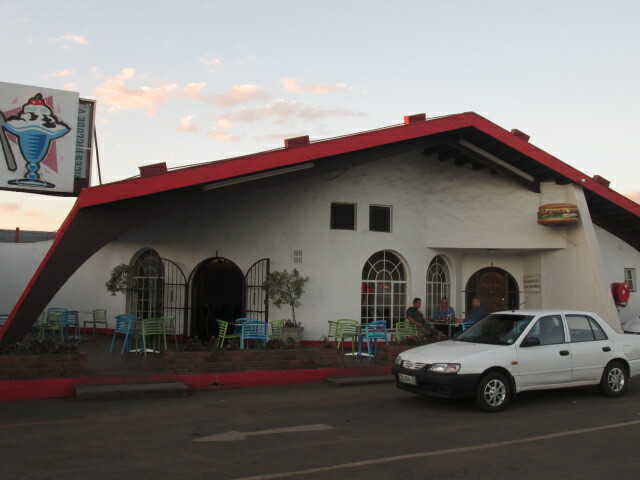 We went so many times as a kid always ate at roadhouses in Joburg – I have been to Tropicale once or twice – was also reminiscing about it on Sunday 🙂 and Exel Roadhouse along the beachfront. No night out was complete until we went down to Exel. Drive-Ins and Roadhouses something future generations will never get to experience. Ahh great to meet you on my wavelength. Did you also hear Sam talking about them last week? The Fireplace in Boksburg is the best roadhouse I have ever been to. Brings back a lot of childhood memories every time I go there. 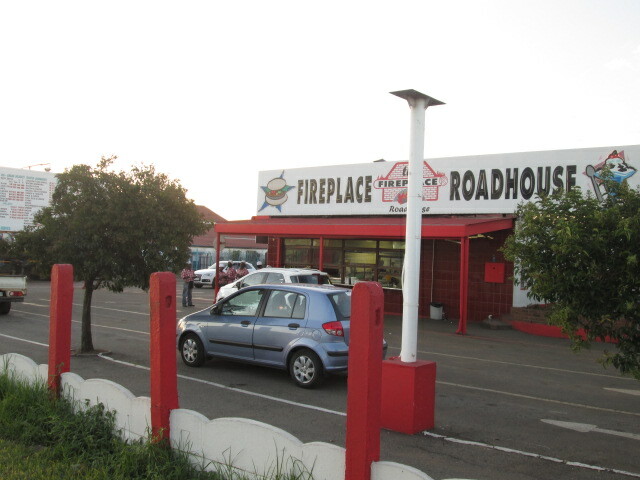 I did not realise Boksburg had 6 Roadhouses! I will have to make a turn by the Fireplace whenever I am in Boksburg again.